Thousands of women who never thought they could grow their afro hair have done so. Could you be one of them? If you are a woman with curly or afro hair, put GrowAfro® to the test and start the journey of growing your hair. Do you suffer from dry hair and itchy scalp? Is your hair damaged, struggling to grow and retain length, breaks easily particularly at the sides, and thin? 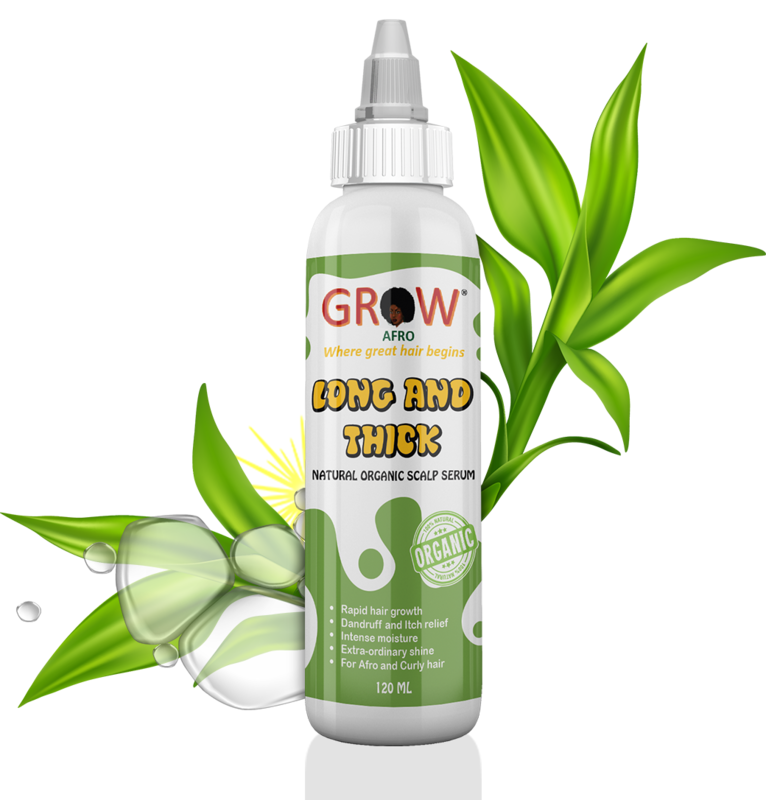 Reverse this with GrowAfro® Long and Thick. This is what my hair has been waiting for, its like a miracle cure for black hair. Absolutely fantastic product. My hair is finally awake and thriving. I have been using this product daily, more than instructed. My scalp is no longer itching and my dandruff has disappeared! My hair seems to be finally growing and doesn’t break as much. Highly recommended. Don’t use a lot as it stretches. I would say use daily for best results. I will continue using it. This product came highly recommended. I bought it as its not too expensive for an organic product. I am very pleased with the results. I will stick to this one. My hair seemed to have reached a plateau and wouldn’t grow any further. It appears to be growing, but I have to watch it for a while longer to make sure. It definitely better moisturised, especially my scalp. So I will be buying again. My client is taking this product with her when she visits my salon. I use it on her hair after a wash. I thought it was just another product. I was very wrong. I can see the major difference in her hair already, so much thicker and fuller and feels so good! so I bought one for myself. I want to sell this product in my salon. Thanks, will buy again. Bottle should be much bigger, but otherwise very good product. I love the fact that it is organic and has no hidden nasties! Love the smell and my scalp and hair is loving it too. I need to see growth first. Best product I have tried. The rest are in the bin. Should have a loyalty programme though so that’s why I am giving it 4 stars. I bought this product based on reviews. Best decision ever. You do not need a lot of it either if you are a natural, a little goes a long way. Been using this product for the past 3 months. It feels as though my hair is thicker and heathier. Is not breaking as much as it use to, my scalp is free of dandruff and shiny. I can’t wait to see more results with continued use. I don’t usually give reviews but I think growafro deserves it. I have been using this product for my hair sides as they are very very getting thin. I notice that it is growing back a little. I will continue to test it on my hair sides. My scalp is definitely loving it, always look like its freshly washed. Moisturizes hair well. Good for wigs as it keeps my hair moisturised under wigs.! The only negative is that it gets solid and I have to put bottle in warm water. Quick delivery. I have used a bit of this oil in my hair and scalp as I have thin hair. I see the difference on my scalp almost immediately. Nice pleasant smell too. absolutely love it! smells so good, and it feels great on my scalp. I have really bad dandruff which returns 3 days after washing my hair. now, I don’t see much of it at all and it is day 9. As for itching, it is gone. Scalp is as clean as ever, it not irritating at all. My hair is so shiny and looks healthy. Thank you grow afro! Very pleased with this item. It makes my hair shiny and less itchy. I can finally see my scalp. I bought this after seeing the benefits and it is also organic so I thought I’d give it a go. My hair was always dry and itchy. After just using this once I could see and feel a massive difference. Scalp was nice and clean and didn’t itch, hair was moisturised in a way that I’ve never experienced. .I’ve been using it for a month. The difference to my hair is out of this world. 100% recommend this product to anyone with dry,fizzy hair and itchy scalp. Bought this for my wife as she was always tapping her head when wearing wigs. So embarrassing for me. Now she doesn’t do it as much. Should have it on a deal for return customers. I agree with everybody. With this product I don’t have to wash my hair too often. I suffer from dandruff really badly and itching. I started using this product 2 weeks ago after seeing the reviews. I usually scratch my scalp until it bleeds. My scalp has significantly improved. I am very pleased with the result. My scalp is usually white with dandruff, but not anymore. Thanks you very much for the free bag. The packaging is wonderful. I like the fresh smell and my hair loves it. After using your product for a couple months, have to admit that it is amazing. My hair definitely feels softer and moisturised. I have been using GrowAfro for only about a month now and I’m already seeing remarkable results. I have struggled for years with dry itchy scalp and this problem has disappeared since I’ve been using this product. I didn’t realize that my scalp issue was the real reason why my hair refused to grow. Everyone now comments on how my hair looks healthy and is growing. I’m so thankful and happy to have found GrowAfro!